According to a recent Forrester Research study, 68 percent of retailers reported that creating personalized experiences is a priority for their company. Yet, like eating right, exercising more, saving for retirement, and so many other things we all know we should be doing, personalization seems to be a tactic marketers say they’ll use in the future, but never really do. We see it in our inboxes each and every day: the majority of marketers simply don’t use personalization, or when they do, they use it in a fairly limited, predictable way. Even worse, they may use personalization in a way that can subject them to surprising risks. For example, a retail marketer may create a personalized email and populate it with a handful of items a specific customer has expressed interest in before. Yet if the recipient responds only to find that the sale is over, inventory is gone, or the price has changed, they will be understandably disappointed. They may even share their frustration with friends and family, which may lead to a ripple effect where a small group of consumers may choose not to shop with this brand again. Ouch! The good news is that it’s not too late for marketers to embrace personalization, both to differentiate their company and to achieve powerful business results. According to a research report from The Relevancy Group (TRG), effective behavioral targeting delivers an eight percent increase in email revenue. Additionally, real-time targeting using open-time and live business context data provides a 13 percent improvement. Open-time data is an example of new innovations that are helping marketers improve personalization and increase program performance. Using consumers’ on-the-ground conditions around location, device, weather and time brings a new level of relevance to email that demographic or preference data hasn’t accounted for. Same for real-time website behavior; with it, retailers can create and send extremely personalized emails such as cart abandonment, win backs, or retargeting. It becomes a smart business decision. Research shows that consumers like to receive these types of emails. The same TRG survey found that 55 percent of respondents reported that they prefer emails that include relevant products and offers. This level of increased engagement is exactly what Liveclicker’s client Stella & Dot was trying to achieve, especially since its first attempts at personalization weren’t working as expected. For example, consumers could interact with up-to-the-minute product photos on Stella & Dot’s website, but in email, the imagery quickly became dated as new posts were added. Additionally, products in emails were not always available after a promotion went out, leading to too many frustrated customers. To overcome these challenges, Stella & Dot implemented a real-time email personalization solution. This technology now lets the retailer use consumers’ actual behavioral data from their interactions on its website and generate highly personalized content in its email campaigns. Because these emails rely on moment-of-open data, Stella & Dot has been able to create contingency plans. Now, if inventory ever sells out, the email pulls in another example of fresh, relevant content. 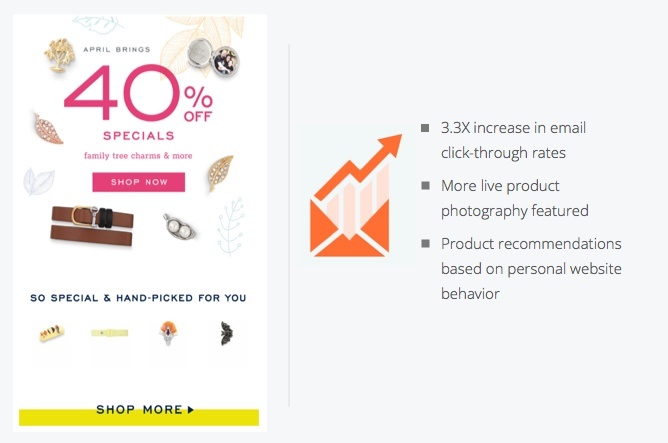 As a result, Stella & Dot gained a new ability to offer personalized product recommendations based on website behavior and saw a 3.3 percent increase in email click-through rates. The retailer’s emails now offer one-to-one messages that highlight recipients’ known items of interest. Not only did this overcome occasional frustrations, but it has significantly increased customer engagement and loyalty – important results for any retailer today. Revenue numbers associated with email marketing continue to grow, but this trend is mostly attributable to the increased number of brands using this channel. This success also leads to more competition for consumers’ attention and emphasizes the need for retailers to do all they can to provide highly relevant customer experiences. Brands using sophisticated personalization tactics are bound to see dramatic improvements in email opens, click-throughs, and conversions. Even better, this success adds up where it matters most: increased revenues and a stronger bottom line. For more on what brands are doing to meet consumer expectations for individualized messaging, click here to check out the top priorities, investments, channels and strategies of today’s B2C digital marketers. Justin Foster is an entrepreneur specialized in online marketing and eCommerce. 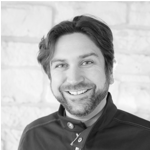 Passionate about helping businesses deliver 1:1 consumer experiences, Justin leads Liveclicker and the company’s initiatives to help clients drive measurable benefits from real-time email personalization. In his career, he has founded the Video Commerce Consortium and Email Marketing Roundtable, as well as led the services practice for WhatCounts, an email marketing technology provider.